Based on the questions you answered when setting up your account, you will have defaults set to your account. We at D-Tools feel this best suits your company size, project complexity, and organization, but we want to make sure you can customize to fit your needs. In the bottom left, you can click on your profile and select settings. From there, select Opportunity Stages in the Opportunity settings. You will see the predefined opportunity stages in there already. You can add, delete, or edit any of the existing states. Note, there are some requirements for customizing these stages. To Add a system, select the Add button below the table. Name the stage, give it a probability, and give it a system stage. To Delete a system, click the trashcan next to any of the stages. Remember you must have at least one stage for each Open, Lost, and Won system stages. 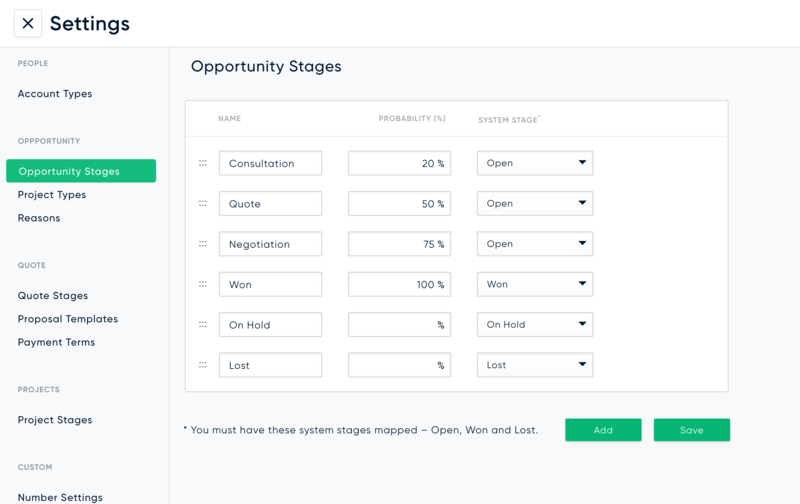 Drag to reorder the opportunity stages so you can get in an order that matches what you prefer. Additionally, you can manage your stages from the more menu in the Opportunities View as demonstrated below.